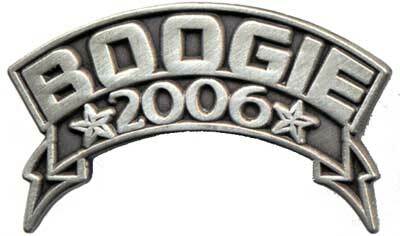 Pewter 2006 Boogie Pin is single pewter color and is arched in a ribbon with stars at each end of the 2006. This double clutch back pin is the largest of the Boogie pins, measuring 1-1/4" x 1". Boogie 2008 flaming skull pin, approximately 1" x 1/4" in size. 2009 Boogie Pin (1.75" x .5") silver pin with green and yellow, double clutch pin back. 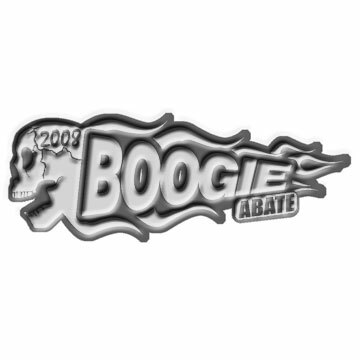 2010 Boogie Pin (1.75" x .5") silver pin with red and blue, double clutch pin back. 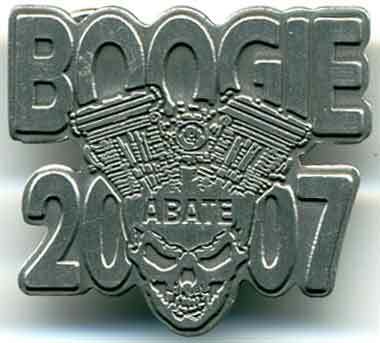 2012 Boogie Pin (1.75" x .5") silver pin with black and blue, double clutch pin back. 2013 Boogie Pin (1.75" x .5") silver pin with purple and green, double clutch pin back.